The total redesign is to attract a new generation of readers and advertisers and includes a poster-style front page and a digest of the major stories on page three. It’s also got an expanded 4-page listings section. "We wanted to take a more radical and unconventional approach in design, presentation and content. I'm confident that our readers will love it and our advertisers will be thrilled with the changes,” said regional managing director, Steve Anderson Dixon. It’s been designed by Spencer Rowbotham, head of creative for Trinity Mirror Regionals and Justin Connolly, MEN’s senior designer. “We've very excited about the new look Advertiser. We'll still be carrying all the news from around our community but with a fresh twist,” added editor, Bethan Dorsett. "We aim to make the Advertiser the essential guide to the week ahead with an emphasis on the wonderful characters that make our town tick. "I firmly believe that we are merely custodians of the Advertiser and its true owners are our readers. As such, we'll be making a fresh appeal to our readers to tell us about their news, views and celebrations and we'll be making it easier than ever before for readers to get in touch with us." Published free every week, the paper has a readership of around 85k, but the hope is that the shorter, punchier page leads, increased story count and community-focused pages will reinvent the newspaper. 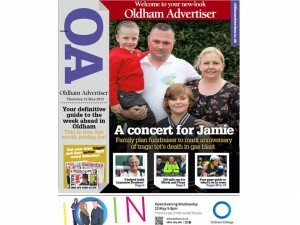 "The focus of the content is on the communities of Oldham. This is their paper and they have a chance to play a bigger part in helping us decide what we publish in terms of news and views,” explained Rob Irvine, editor-in-chief of MEN Media.